Buying or Selling a home? Search Realty will donate a proceed of every sale to support SickKids and their quest for improving children’s health. Search Realty is proud to announce its sponsorship with the SickKids Foundation. 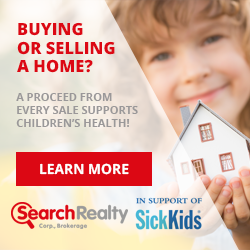 For every commission received for the sale of a home, Search Realty will donate 1% to support SickKids and their quest for improving children’s health. It’s a commitment that Search Realty is proud to undertake, and SickKids Foundation is a cause that Search Realty firmly believes in. SickKids is a testament to what can be done when a community comes together for a worthy cause. SickKids Foundation is focused on attaining one goal, which inevitably leads to another: Healthier children and a better world. Established in 1972, SickKids Foundation raises funds on behalf of The Hospital for Sick Children. The Foundation's fundraising is driven by the belief that improving the health and well-being of children is one of the most powerful ways to improve society. The foundation inspires communities to invest in health and scientific advances that lead to improved living for children and their families, in both Canada and the world. SickKids Foundation has been around for more than four decades, and never more has the charity of others matter most. There is still a great need to further understand the causes and cures of childhood diseases, which is why SickKids depends on philanthropic support from the community. Search Realty has chosen to partner with SickKids, because of the fact that SickKids is a global leader in children's health research and care and is one of the top children's hospitals in the world. Another reason Search Realty has chosen SickKids is because the President himself Sterling Wong was a patient at SickKids. Sterling says “I know first-hand, how sick children feel to spend a portion of their lives in a hospital but I felt very safe and comfortable knowing I was in good hands with the best doctors, surgeons and staff looking after me.” Sterling gratefully thanks SickKids Foundation and their entire staff and sees this sponsorship as a great opportunity to give back as he is now in a better position to do so. Each year, SickKids treats more than 100,000 children, including some of the most complex cases and next to government, SickKids Foundation is the largest funder of child health research, learning and care in Canada. Further to that, SickKids is not studying a single childhood disease, but rather, studying all of them. More than that, SickKids shares knowledge with children's hospitals across Canada and around the world. A partnership with SickKids allows Search Realty to be recognized as a supporter of child health and provide the support that SickKids requires in order to continue to improve the health and well-being of children in Canada and around the world. Search Realty wants to do its part, and support a foundation that its Realtors hold dear to their heart. But Search Realty, like SickKids, can’t do it on their own. It all starts with the home buyer. By choosing Search Realty, home buyers are now pledging to support children’s health. For every commission received for the sale of a home, 1% will be donated to support SickKids. Search Realty clients, employees and the children and families in the community benefit from the discoveries made at SickKids Foundation. These discoveries are transforming child health, and because of the support of Search Realty and those in the community, the necessary support is provided to aid in the critical work involved in saving the lives of children. Thanks to the support of Search Realty and other partners and corporate philanthropy, SickKids will continue to be a world leader in pediatric research and care, meeting the health care needs of today’s children and ensuring that we get a head start on the health challenges facing the children of tomorrow. For those buying or selling a home, now it’s not simply about achieving a lifelong dream, but also lending a hand to a worthy cause, as Search Realty will donate a proceed of every sale towards saving a child’s life. Search Realty Corp., Brokerage is a real estate company utilizing the best tools and technology to serve the needs of today’s Home Buyers, Sellers and REALTORS®. Search Realty Corp. has quickly grown to 100+ websites, over 15,000 Unique Visitors per month and 135,000 Page Views per month.